What is Chart Maker Online? How do I Access Chart Maker Online? What is a template and How do I select it? How do I select a chart type? How do I select the number of generations to be displayed on my chart? How do I select a chart background image and/or chart colors? How do I select what I want displayed? How do I select box colors? How do I select box fonts? How do I select the options for display within a box? Surprise Family Members with Beautiful Prints of Your Family Tree. Select the type of chart, e.g. Ancestor Chart, Descendant Chart. Add Individual Photos; Decorate Your Chart with Custom Colors and a Custom Frame. Select which Data You Want to Include for Each Individual. Select the Number of Generations. Add Standard Backgrounds or Upload Your Own with Selectable Opacity (Transparency). You have Chart Maker Online's Full Capability Free with a Paid Research Account. Free Version of Chart Maker Online Available for non-paid Accounts. 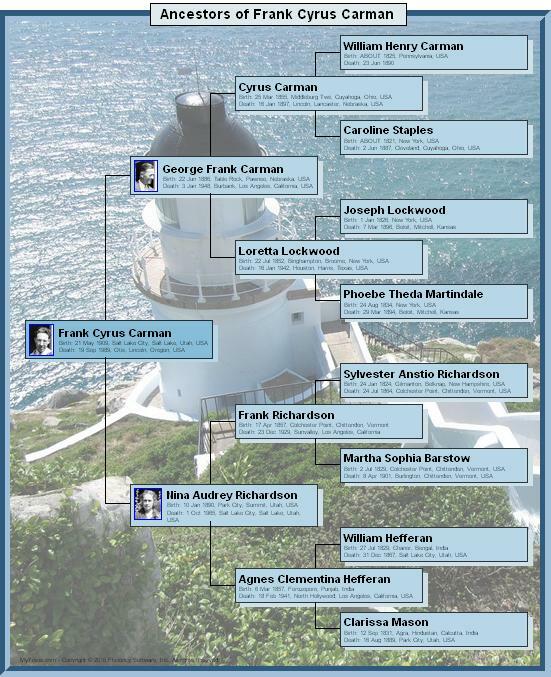 From your pedigree display of your family tree at MyTrees.com simply click the husband's name or the wife's name as the person whom you want to see as the first person in the chart. Then, from the pop-up menu, select the second item, "Chart Maker for...". It's that simple. If you want a child of a family as the first person in the pedigree display, then click from your pedigree display the family's children icon (upper right of family box) and select the child of interest. 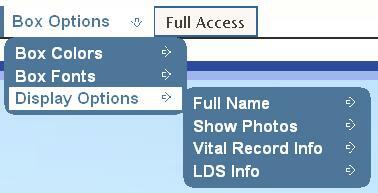 Then select the third from the left icon (Chart Maker) in the icon bar above the vital record information. Again, it's that simple. A template is one of the first things you will want to select or create. The template represents the basic layout of your chart and its color scheme. You can select a pre-defined template or create one of your own. Use the "Chart Templates" menu option to accomplish this. You may save out a customized template, naming it uniquely, so that you can re-use it over and over again. You can use the template menu item to quickly view the options that you've selected so far for your chart by clicking the sub-menu item "View Chart Template Specs". To get a print of your chart, select the sub-menu item "Print Chart". When the pop-up window with you chart appears, use your browser's capability to print the window. You will want to determine the chart type to be displayed, e.g. Ancestor, Descendant. To select a chart type, select "Chart Options" from the main menu bar in Chart Maker Online; then, select the first entry, the Chart Type option. Move down the Chart Type menu to select the particular chart type of interest. 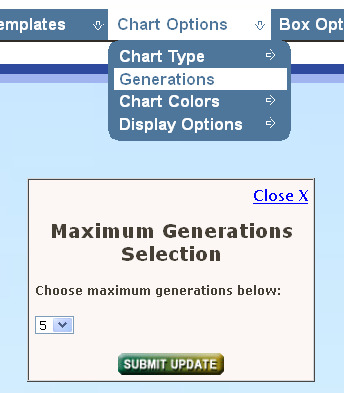 To select the number of generations for display, select the "Chart Options" from the main menu bar in Chart Maker Online; Then select sub-menu option "Generations". A pop-up window will appear where you can select the number of generations from the pull-down option. After making a selection, click the "Submit Update" button in the pop-up window. As with this any other formatting selections, you will notice that your selected and named chart - just to the left of the Chart Make main menu - will be marked with an asterisk each time a selection is made. This asterisk simply indicates that a change has been made in your template. To remove this asterisk, just save out the current configuration of your template from the template menu option. To select a chart background image and/or chart colors, select the "Chart Options" from the main menu bar in Chart Maker Online. Then select sub-menu option "Chart Colors". From here you have several possibilities to customize both chart colors and chart background image or color. You might also want to play with the background image opacity to get the professional feel that is desired. To select display options, select the "Chart Options" from the main menu bar in Chart Maker Online. Then select sub-menu option "Display Options". From here you have several possibilities to customize the layout of your chart. The "Chart Content" option off of the "Display Options" menu heading allows for display of all the chart boxes that represent individuals or just those that weren't pruned. Tree pruning occurs only on certain charts, such as the Descendant chart. To prune such a chart, select from the Chart Maker Online main menu: "Chart Options / Display Options / Chart Content / Show All". All individual boxes in the descendant chart will appear on the screen. Each box will have a green (Go) button centered at the bottom of the individual box. To prune this branch of the tree, simply click the green button, turning it red (Stop). Do this for all tree branches that you want pruned off. Then, select "Chart Options / Display Options / Chart Content / Show (green button) Only. This will cause all individual boxes marked with a red button and all their descendants not to be displayed. 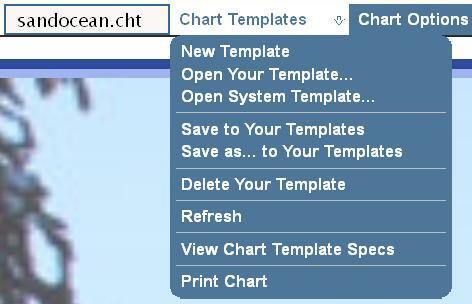 This is the form, then, that you will publish by selecting "Chart Templates / Print Chart". 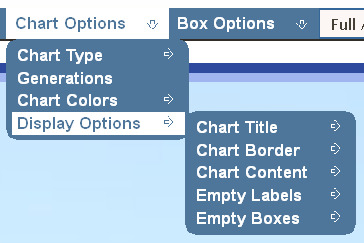 To select a box color, select the "Box Options" from the main menu bar in Chart Maker Online. Then select sub-menu option "Box Colors". You now can select what box colors that you want for "Research Done" (meaning you've completed all that you're going to do on this individual) and "Research Not Done" (meaning you have yet to do some more research on this individual. You can also select at this time whether or not you want a drop shadow for the box and what its color will be for both Research Done and Research Not Done. 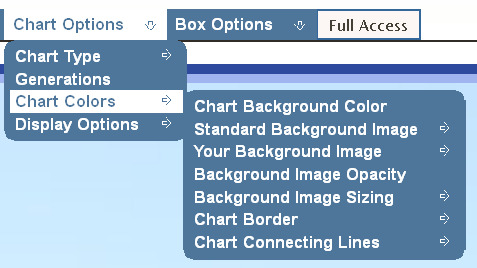 To select box fonts, select the "Box Options" from the main menu bar in Chart Maker Online. Then select sub-menu option "Box Fonts". From here you can choose font information for both the individual's name as well as the individual's vital record information. To select options for display within a box, select the "Box Options" from the main menu bar in Chart Maker Online. Then select sub-menu option "Display Options. From here you can make several selections of those things that you want included in the individual boxes within your chart.